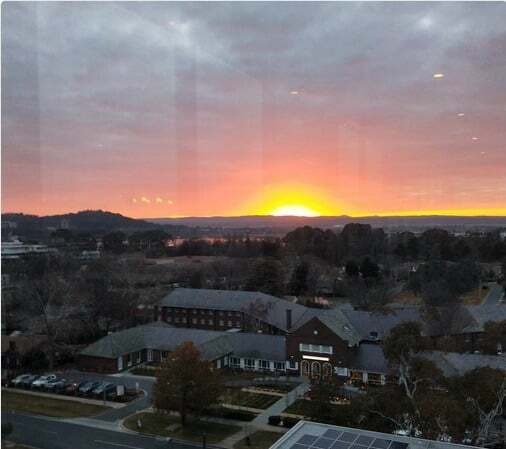 Image tweeted by AHPA for @WePublicHealth: "What a beautiful sunrise to start a great day at #AHPA2018"
After attending the Australian Health Promotion Association’s National Symposium in Canberra last Friday, Jennifer Doggett came away with six key reflections, arising from the presentations and discussions. 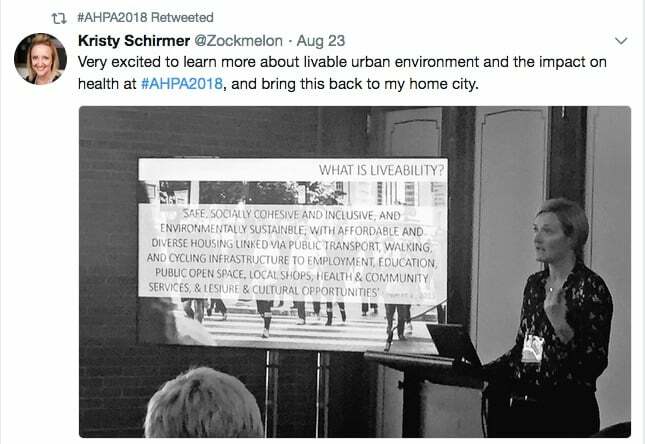 A Twitter wrap will also be posted in coming days – and here you can read Doggett’s preview of #AHPA2018 for the Croakey Conference News Service. As federal politicians argued over the future leadership of the country in Parliament House, a group of health promotion experts and practitioners gathered further down the Parliamentary Hill to discuss the future health of our planet and its people. 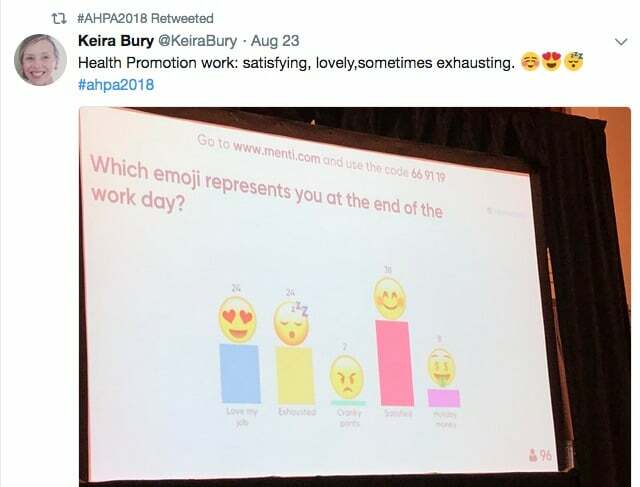 The Australian Health Promotion Association’s 2018 Symposium was held in the shadow of the media circus descending on Parliament House but the issues debated at this event will outlast even the most successful political leader. The theme for the Symposium was Better Practice: Better Placed and the impact of the political turmoil on the event (everything from parking hassles to cancelled speakers) was a timely reminder that place and timing do matter – in politics as in health promotion. The Chair for the day, Professor Peter Sainsbury, related an anecdote from another APHA event at which the (then) Minister for Health, Senator Kay Patterson, was speaking. About half way through her speech, there was a flurry of activity among her advisers, standing in the audience glued to their phones. When she finished, one of them went and whispered something to her. As it turned out, Patterson had just been removed from her role, due to a Cabinet re-shuffle by then Prime Minister John Howard. This anecdote highlighted the transience of political leaders compared with the continuity of leaders in the health promotion community. The scale and importance of the issues being discussed at the Symposium, such as the health implications of the destruction of entire ecosystems, contrasted markedly with the poll-driven focus of the politicians. One day in January 2018, Penrith was the hottest place in the world. This startling statistic, presented at the Symposium by Professor Susan Thompson from UNSW, highlights the immediate and serious health threats that global warming poses to our community. Thompson discussed her work as an urban planner in taking the social determinants of health into broader global ecosystem thinking about climate stability and biodiversity. She explained how urban planning can be used to create a built environment that supports people and planetary health. For example, Thompson explained how planning our houses and communities to reduce the heat load during periods of high temperature is important in order to reduce the risks associated with heatwaves. This can be achieved through the design of buildings and the use of materials and also the creation of “green spaces” within urban areas that can absorb the heat and create shade. She stressed that the benefits of green infrastructure go well beyond reducing heat loads and include increased economic activity, higher property values and more tourist activity. Heatwaves are already Australia’s most dangerous natural hazard, killing more people than higher profile events such as bushfires. Global warming and the effects of climate change increase the chance that we will experience more extreme weather events, such as heatwaves, into the future. This means that we need to incorporate planning for extreme heat events into housing developments and when new communities are being established, particularly in inland and outer urban areas where heat loads are the highest. Thompson also addressed the broader health impact of urban planning and outlined three domains in which urban planning can have the most impact in addressing risk factors for chronic disease: physical inactivity; social isolation; and access to healthy foods. Associate Professor Hannah Badland from RMIT talked about the potential of the “livability” of houses and communities to widen or reduce existing inequities. She stated that around a quarter of deaths worldwide are attributed to the environment so that there is the potential for significant health gains by making environmental changes. Badland identified the following levers for equity in planning community infrastructure: education, employment, food, alcohol and tobacco, green space, housing, transport and walkability. She pointed out that most of the resources promoting these factors are concentrated in more affluent areas and that this has led to a concentration of poverty and disadvantage. She also described how many disadvantaged people have “smaller” communities, due to lack of mobility and resources to travel, so that their local environment is even more important than it is to more affluent people. She urged delegates to use planning processes to reduce, rather than widen existing inequities and suggested that they “use an environmental justice lens when doing planning” in order to become good stewards of the earth’s natural systems and safeguard the health of current and future generations. As our cities grow to record sizes, it is imperative that urban planning to promote health occurs as a matter of course and not as an optional add-on. As we learnt this January, this is not a problem we can afford to kick down the road for another generation. It’s easy to be overwhelmed by the scale of the devastation humans have already caused to our natural environment and to forget the important role that local solutions can play in combatting seemingly unsurmountable problems. There is no doubt that our planet has been damaged by the need to support its current population of around seven billion people (and growing). For example, the industrial food processes we need to feed this many people have caused widespread soil degradation, de-forestation, water scarcity, loss of pollination and over-fishing. One serious health threat resulting from these activities is the emergence of new infectious diseases such as Ebola and Zika. Other immediate health problems associated with industrialisation are the three million unnecessary deaths each year due to ambient particles in the air and the four million people who die due to solid fuels cooking (most of whom are women). Every one of these deaths is a tragedy but this does not mean that we should walk away from the benefits of modern life. As Professor Tony Capon pointed out, the human population now is healthier than ever before and life expectancy continues to increase, although there are striking inequities between wealthy and developing countries. These gains are important but it is equally important to recognise that in achieving them we have exploited the planet at an unprecedented rate. This cannot continue indefinitely and now that we understand more about the links between environmental changes and health, it is time to re-think the way impact on the planet’s ecosystems. Strategies suggested by Capon and other presenters at the Symposium included focussing on sustainable cities, active travel, green spaces, healthy food, resilience to extreme weather events, efficient use of water and fertiliser and reducing food wastage. Much recent research about the relationship between health and the environment, such as research into the impact of climate change on health and well being, involves re-learning what Aboriginal and Torres Strait Islander peoples (and many Indigenous peoples worldwide) have known for generations. A number of presenters, including keynote speakers Professor Fran Baum and Professor Lisa Jackson Pulver, highlighted the impact of colonisation on Australia’s natural environment and how this has affected the health of Aboriginal and Torres Strait Islanders. Capon also argued that planetary health is foundational in Indigenous understandings of health globally. He said that modern life has, to some extent, insulated us from the immediate impact of environmental changes, which gives us the illusion that we are immune from the impact of damage to our ecosystem, for example, via climate change. However, Indigenous people, who have traditionally lived with a more direct connection to the land intuitively understand that our health and well being depends on natural systems, such as the air we breathe, water we drink and the stability of climate system. Capon went on to discuss in more detail the challenges of promoting health in the “anthropcene epoc”, (the period covering the time where humans have had a significant impact on the Earth’s geology and eco-systems), and argued that non-Indigenous Australians should learn from Indigenous Australians how to place the health of the planet at the centre of all efforts to promote the health of people. The role of data in informing the development, implementation and evaluation of health promotion programs was the focus of the keynote presentation from Barry Sandison, Director (CEO) of the Australian Institute of Health and Welfare (AIHW). Sandison highlighted AIHW’s work on the relationship between different health risks, such as obesity and alcohol use or homelessness and juvenile justice, and the relevance of these links for health promotion. He said the work the AIHW had done on domestic and family violence was a landmark in his efforts to broaden the work of the institute into linking health and social issues. He also stressed the increasing importance of geographical analysis of health data and described a new software system the AIHW was using to look at chronic kidney disease prevalence across different areas. He believes that this approach can provide snapshots of information from different data sources that are useful for developing local programs and interventions. Sandison stressed that as well as collecting data, it is also crucial for AIHE to point out where data is missing. He identified two key areas in the health and social care sectors where he believes more information is needed to inform policy and program development. One is in the area of disability, in particular data on disability issues and people with disabilities to inform the rollout and evaluation of the National Disability Insurance Scheme (NDIS). The other is primary health care where there has been a lack of nationally consistent data on service provision. Sandison stated that AIHW had received funding in May this year to set up a team to look at primary health care data collection. He welcomed this funding but questioned why it had taken this long to establish a national data set in this vital area of health care. He also said that a key goal of his was to build an Indigenous data hub to inform policies and programs on Indigenous health issues. 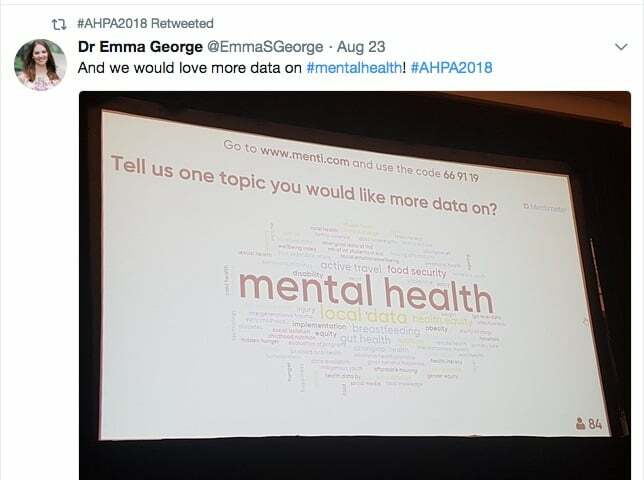 As part of Sandison’s presentation he conducted a ‘real time’ data gathering exercise and found out that the greatest challenge facing the attendees in their work was ‘funding’ and the main issue they wanted AIHW to collect more information on was ‘mental health’. One attendee commented positively on the balance between academic researchers and ‘on the ground’ practitioners in the presentations at #AHPA2018. In fact, many of the presenters straddled both worlds and discussed how their research was being used to influence the delivery of health promotion strategies and programs. For example, Dr Xiaoqi Feng described her work in partnering with local and state/territory governments to develop a national set of spatially derived built environment liveability indicators related to chronic disease risk behaviours and health outcomes. The aim of this project is to create a national database of built environment spatial indicators that can be used to measure progress towards creating communities that promote health and reduce inequality. The ‘Rapid Presentation Program’ showcased a number of smaller scale projects targeting Indigenous, culturally and linguistically diverse (CALD) and low socio-economic populations. These revealed the creative and innovative approaches being used in health promotion practice to work with disadvantaged and often marginalised communities. A general theme stressed by most of the presenters was the importance of partnering with representatives of the community from the start of the development of the project, rather than expecting their support for the implementation of a project that has already been designed without their input. A number of presentations demonstrated how health promotion is taking a social determinants of health perspective to addressing health challenges. For example, Crystal Hillery and Natalie Virgona described a partnership they had developed with the justice system where vulnerable and disadvantaged people are able to reduce or eliminate unpaid fines by participating in specific health and well-being programs. This program simultaneously addresses the higher incidence of unpaid fines among disadvantaged groups and uses their interaction with the justice system as an opportunity to target specific health challenges, such as adherence to recommended treatment programs. 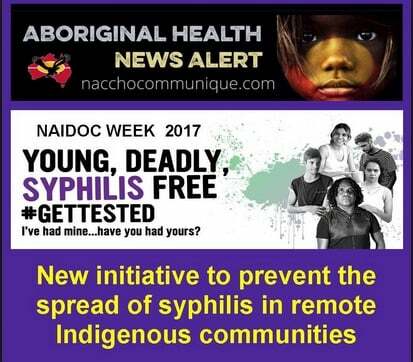 Allison Barrett highlighted the role of social media in the Young Deadly Free campaign to reduce the harms of syphilis among young Indigenous people living in remote areas. The project led by James Ward in the Aboriginal Infection and Immunity team at the South Australian Health and Medical Research Institute (SAHMRI) used Facebook, Twitter, DivaChat and YouTube to reach young people living in remote Queensland to educate them about the dangers of syphilis and how to protect themselves. A key takeaway message from her presentation was the need for multiple strategies to target hard-to-reach groups as the different social media platforms have different audience profiles and also vary in their reach and level of engagement with the target audience. Other projects featured in this session targeted university students, people in residential aged care and people from diverse cultural and linguistic backgrounds. This showcased the range of different strategies being used to engage local communities in the development of successful health promotion initiatives. The challenge raised by the success of these projects is how (and when) to scale them up so that they can benefit a broader population. There is no simple equation for how to balance the need for local relevance in health promotion strategies with the potential gains that can be achieved through their wider application. However, sharing successes (and failures) at forums like AHPA 2018 is a useful first step towards identifying which small-scale initiatives have potential applications beyond their immediate target groups and communities. 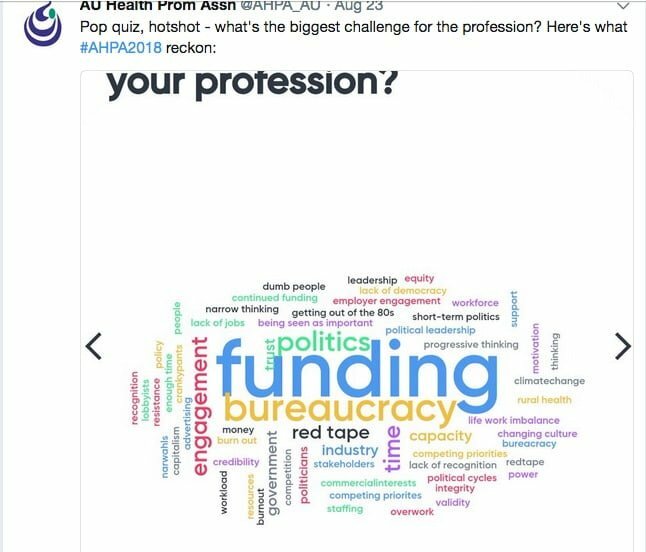 • Stay tuned: coming soon at Croakey is a great, big Twitter wrap of #AHPA2018. Also, check a selection of tweets by @WePublicHealth (see week of 20 August) during the Symposium. • Jennifer Doggett attended the conference on Friday 24 August. The program can be seen here.